It must be emphasized that the early Christians and all peoples living at that time were much more attuned to symbols and arcane meanings than people of the 21st century. 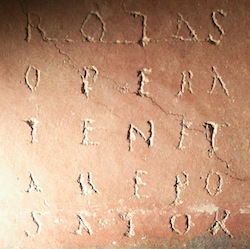 The Greco-Romans, Christians and pagans, were steeped in myths, mysteries, metaphors, omens, divinations and allegories. Everything that happened meant something and every thing had a riot of meanings around it. 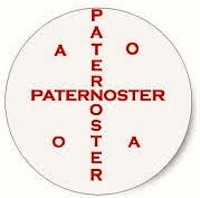 To enter the world of early Christian symbols is to enter a very rich, deeply intellectual and poetic world of meanings. 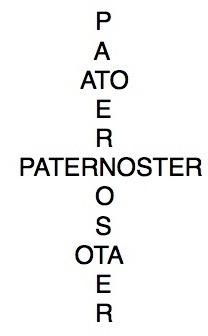 When the five-letter Latin words are read in line order horizontally or vertically or backwards or forwards or bottom to top or top to bottom, they mean: “The sower, Arepo, holds or works the wheels with care.” Another translation is: “He who works the plow sows the seed.” The Sator Square is a combination of a palindrome where the words read the same backwards and forwards and, in this case, line by line either vertically or horizontally and a cryptogram where all the words are written in such a form or order that a key is required to understand the sense. 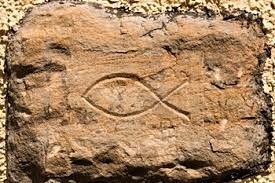 The 1st century Christians were a persecuted minority forced to identify themselves to each other by secret signs and actions, the most common of which were the primitive fish sign and the spilling of a little wine on the ground. The two cities were buried in August of 79 AD when Mt. 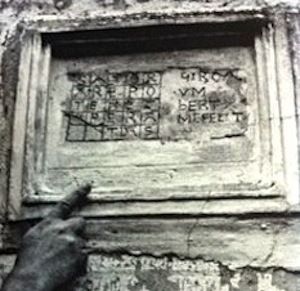 Vesuvius erupted, so these very early Christian Squares were incised before then, maybe in the late 60’s AD (only c. 30 years after the Resurrection) when the Imperial persecution of Christians began in earnest. 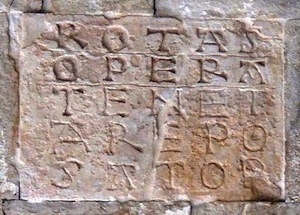 The Sator Square is found engraved on the facade of the door in the c. 752 AD Abbey of St.Peter Ad Oratorium near Capestrano, Italy. It is copied in an 822 Carolingian Bible; in the 1100’s it was inscribed on the masonry of the Church of St. Laurent near Ardeche, France and in the Keep of the Castle of Loches, France. Starting in the 1200’s, the Square began to lose its original meaning and turned up as a help to women in labor. By the 1400’s it was used to quench fires and in the 1500’s the Square is a cure for insanity. R. P. Kirchner (1602-1680) found in his travels in Africa that the Christian Ethiopians invoked the Savior by naming the five nails that pinned Him to the cross: SADOR, ALADOR, DANET, ADERA, RODAS, an obvious corruption of the five words in the Roman Square. 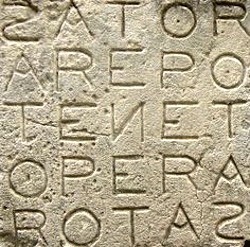 In 1954 archaeologists digging an ancient Roman site near Budapest found a Sator Square on a roof tile from the residence of a 2nd century Roman provincial governor.